First Thursdays are taking an interesting twist at Cape Town’s newest premium night club, Cocoon Cape Town, located on the 31st floor of ABSA building. Art house movie screenings will be held on the first Thursday of every month as of 2 November, 2017 (except December). Doors open at 7:30pm for arrival cocktails with the movies commencing at 8pm sharp. Guests can enjoy old-time favourites in a comfortable lounge setting with bar and waiting service for a super-VIP cinematic experience. Look forward to a variety of featured classics from Woody Allen show reels to silver screen masterpieces like Amélie and Chocolat. 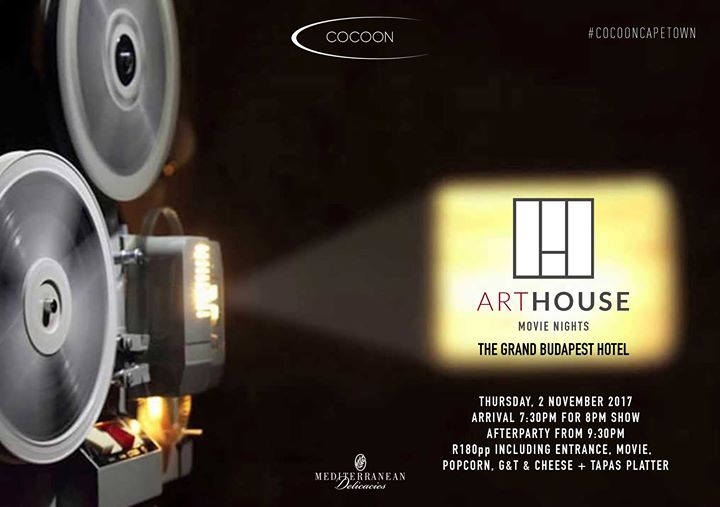 Cocoon movie nights will debut with The Grand Budapest Hotel in November. Tickets are priced at R 180 per person and include a complimentary gin and tonic, popcorn, Mediterranean Delicacies cheese and tapas platter and entrance to the Cocoon club after party featuring a selection of deep house DJs performing until 2am. Tickets available through Quicket. Limited seats available. For any queries, contact sammy@redcarpetconcepts.co.za or head over to Cocoon’s Facebook or Instagram pages to keep up-to-date with their latest events.